"I'm not getting married when I grow up," I once told my Granny Sugar. "You aren't? Well, why not?" she asked with a slight chuckle in her voice. "Because you have to kiss and you get pink lipstick everywhere," said four year old me very matter-of-factly. The things kids think about! I do believe my worries have changed since then! Your wedding day is one of the most memorable and important moments of your life, and lipstick everywhere is just not cute. And speaking of lipstick, you don't have to spend a million bucks to look like it on your special day. Prices and availability will vary by store. 1-Maybelline Super Stay 24--$8.99--Comes in 24 colors and claims to last 16 hours. It features a refillable balm on the other end, necessary to keep lips hydrated. 2-L'Oreal Infallible 2-Step Color--$12.99 (currently on sale for $7.99 at ULTA)--Comes in 24 colors and features a balm on one end. This is one of my must-haves. 3-Rimmel Provocalips--$6.99--Comes in 10 colors and claims 16 hour wear. This features a clear gloss on one end and adorable packaging. This is probably my fave of the five. 4-Revlon ColorStay Overtime--$8.99--Comes in 26 shades and claims 16 hour wear. This is the most compact of the five and I was really impressed with its staying power. It does have a clear gloss on one end with a brush and not a doe-foot applicator. My third fave. 5-Covergirl Outlast All-Day Lipcolor--$8.99--Comes in over 40 colors and claims 16 hour wear. This has two parts, the color and then a separate balm--this can be a bit cumbersome. The balm can be repurchased separately. This claims to be the #1 long-wear lipcolor and is similar to Maybelline. All were kiss-proof, with and without the gloss/balm. L'Oreal, Rimmel, and Revlon lasted the longest, with about 6-8 hours (average) of wearing time before reapplying, but I would still have plenty of color around the lipline, with color fading fastest in the middle of my lips. Which ones have you tried? Any faves? Happy last day of June! Where did the month go? Seriously! Charlie and I are back from out trip to Charleston--more on Friday on that. We had a great time. It's been a year since I've been--one of my fave cities. Add me on Snapchat--it's mostly my life on there! I always add back. Just search for ellesees. currently I'm not using any drugstore lippies, I may have to try one of these. I definitely don't need a wedding day lipstick but these might be perfect for work so I don't have to reapply throughout the day! I've had my eye on the Rimmel Provacalips (the name is too funny, too). I need to pick some up! this is great to know! i'm not a big lipstick person so i don't see myself spending $$$ on it! I haven't tried any of these but I definitely need something with more staying power! What a cute story. I am going to try to test these out for a regular day. I find myself getting so busy that I don't reapply and end up looking like a zombie! I tried the L'Oreal one in shade 211, it's a gorgeous red but the application is patchy and depending on what you eat, it might peel off and reapplication is pretty much impossible unless I remove everything first. And removal is pretty tough with normal cleansing wipes, I do think it's more trouble than worth it. However, I've read great thing on Provocalips so I'm planning to pick those up next. Oh I love this! Nothing like a lip color that stays on for hours! Def need to scoop up that Rimmel one! Can't beat that price! I've been interested in that Rimmel and gotta grab it when I'm in NY again! I like long wearing lipstick to wear every day because I don't have time to reapply. These are such great options! I wouldn't have a clue what to purchase or what works otherwise! Now I want to give that Rimmel one a shot-it's so cute! I love the provacalips and have two different colors! I like Rimmel's 3D glossy lip glosses too and have three of them. Rimmel kills it with the lip stuff! I downloaded snapchat a long time ago and never understood it. I suppose that is old lady problems talking! I've been meaning to try the Rimmel Provocalips. Thanks for the reminder! I can't believe June went by so quickly either. I am a fan of the maybelline one, good color choices too. Ugh, Jury Duty I usually get out of it but still, no fun! I really want to try the rimmel one! This is really helpful.. u guys hv so many options in ur drugstore brands unlike here in India! Oh no jury duty?! No fun. I never know if long wearing lipsticks really work or not so I appreciate your tests! I'm going to pick up the Rimmel one I think--I've had that one bookmarked to buy for a bit now. love Covergirl outlast all day lip color. I have it in a pink and a red. The Rimmel one is my favorite and I've also liked the Revlon one in the past. The L'Oreal didn't work for me at all. I think I must have gotten a bad one because I've heard others rave about it. I want to go to Charleston one day. I mainly stick to a lip gloss. I think it's CoverGirl. Whatever one I had a coupon for! I love the packaging on that Rimmel Provocalips too! So cute! yayy i totally have some of those provocalips! I got two free Nars lip stains on my birthday and I am looking for a reason to give them a try. I love the idea of lip stains since I tend to eat my lip gloss. Not as delicious as you would think. I'll have to try these because who doesn't want kiss-proof lipstick?! 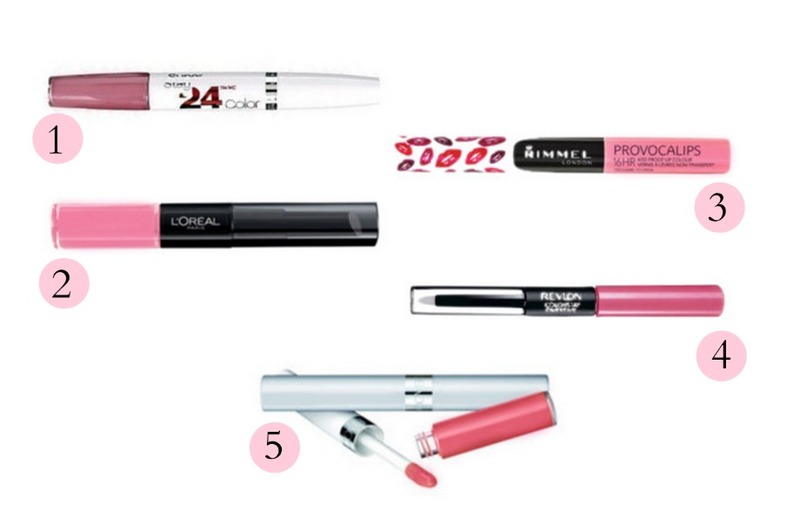 I haven't tried any of them yet, but the Rimmel sounds like the one I'd pick, in coral or peach! I need to try some of these! I have one of the Revlon ones in a mauve, and I love it. Definitely need more. I think I'll try one of the Rimmel next! Wish i would have read this a couple months ago!! It is so hard to find an all day lip product (even though so many claim to be hahaha)! 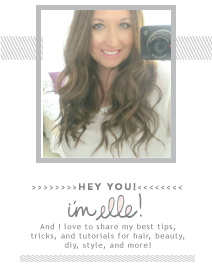 So perfect Elle, you would take the time to find the best drugstore lipstick and we can't thank you enough. We're off to snag some Rimmel shades to try first, that price is everything! Great post, Elle! It's so hard to find long-lasting lip wear! And how funny young minds are! That's really cute! Oh no! You returned from vacation to a JURY DUTY notice?! Oh that is NOT COOL! D: I love Charleston, too. 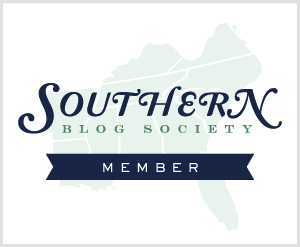 Such a beautiful southern city! Thanks for testing all of these! I tried the Maybelline and a MUFE Aqua Rouge before I got married and I just couldn't. I think I have a weird phobia thing that causes freakiness about having a lip product on that needs an longer makeup remover to take off. Like if I'm out n' about and want to remove it, I'd have to carry pre-soaked pads with me to do it? Can lips have claustrophobia?? I'm such a weirdo. I wore pink lipstick over lip liner at my wedding and only had to reapply a few times and I didn't notice any transfer. Now had I decided to wear red, long-wearing lipsticks would have been mandatory! I bought #5 the other day to try and it was so weird on and the color was way too "frosty" for my liking. 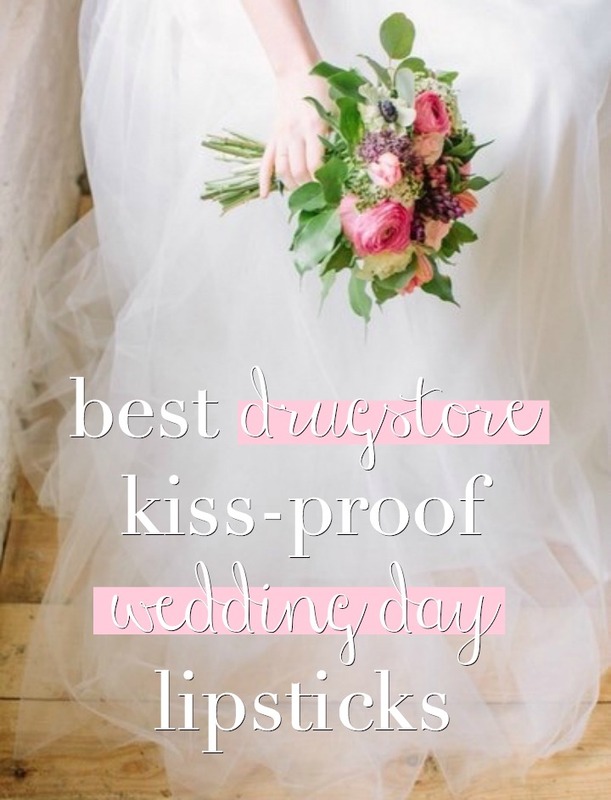 I'm definitely going to try #2 and #3 in hopes to find the perfect pink wedding lip. Thanks Elle! Great reviews about these lipsticks!! I love the light colored pink lipstick. It would look perfect on my wedding day. You know dear I have reserved the one of the garden DC venues for my wedding ceremony.